‘Fruit ovate, very much flattened at the crown, of a very regular figure, quite destitute of angles, about three inches deep, and three inches and a half in diameter. Eye small, with a very short calyx. Stalk short and fleshy, thickening on the back of its bent part. Skin dull brown, like that of the Brown Beurre, a little marked with dashes of a deeper colour. Flesh white, melting, very sweet, rich, and high flavoured. Ripe the middle of November, and will keep good a month.’ [George Lindley – Orchard Guide p.380/1831]. ‘Gansell’s Bergamot’ was said to have been raised from the ‘Autumn Bergamot’ by Lieut. General Gansel at Donneland Park, Colchester in 1768, although George Lindley considered it to be identical to the ‘Bonne Rouge’ pear of France. [PM t.35/1828, George Lindley – Orchard Guide p.380/1831]. 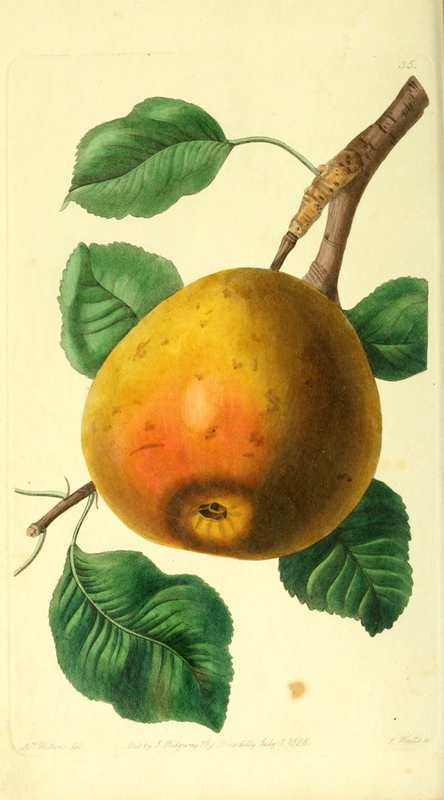 ‘A dessert pear of the highest merit when well ripened.’ [HP pl.LIII/1878]. Also figured in Jardin Fruitier du Muséum [JFM vol.3/1860].